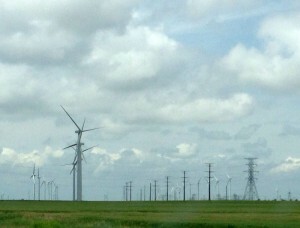 Wind farm near Spearville, Kansas. A big “thank you” to Mike Smith for his rebuttal to an op-ed printed in today’s Wichita Eagle. In the commentary, which was signed by more than 60 members of the clergy from across the state, the writer states: “As people of faith, we believe it is our moral responsibility to care for all that has been entrusted to us.” I think the moral responsibility of people of faith is to refrain from telling lies. And while we’re at it, people of faith should stop using the coercive power of government to force others to conform to their prescriptions for life. God doesn’t do that, and neither should they. Today’s Wichita Eagle has a terribly unfortunate editorial letter from the Kansas Interfaith Power & Light, an advocacy group on the subject of global warming. While everyone is entitled to their opinions, the quality of the science in the letter is dreadful. So, let’s compare the assertions to the science. Continue reading at Misguided Faith. 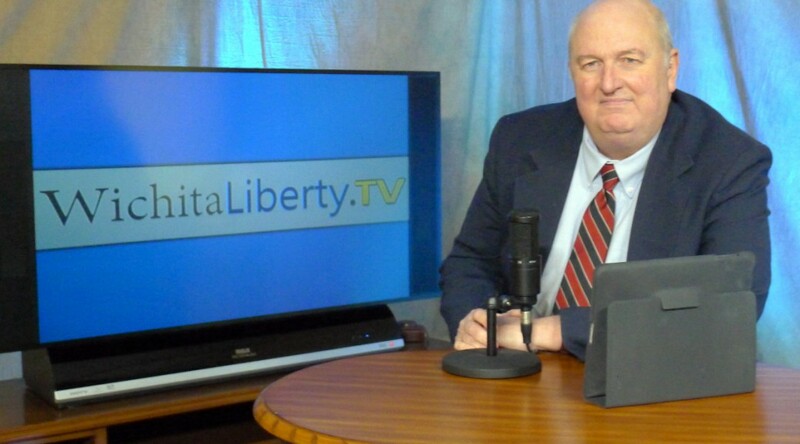 In this episode of WichitaLiberty.TV: The controversy over the timing of city and school board elections provides an insight into government. Then: Can a candidate for governor’s claims about Kansas school employment be believed? Wind power is expensive electricity, very expensive. A Wichita auto dealer pushes back against union protests. Finally, what is the real rate of unemployment in America? Episode 36, broadcast March 23, 2014. View below, or click here to view at YouTube. To the extent that global temperatures are rising, and the extent that mankind is the cause, we should be concerned about global warming. Climate change I meant to say, please excuse me. It’s no wonder that the term global warming has been replaced by climate change. 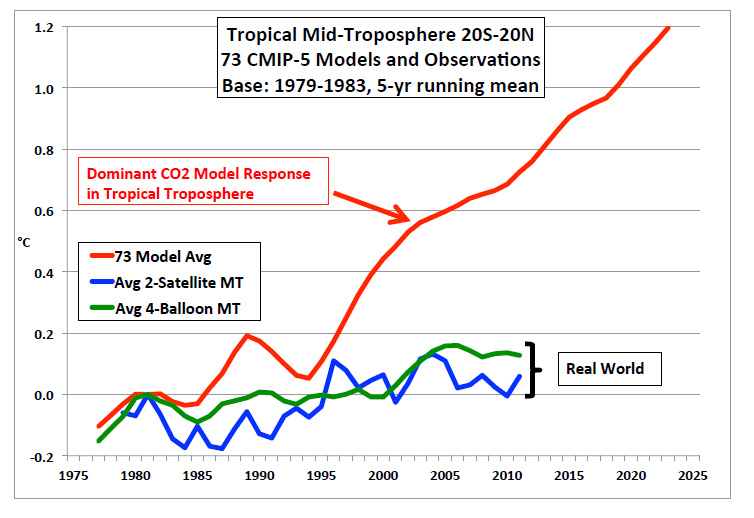 As the following two charts show, the models that are in common use by climate scientists have predicted rising temperatures, but actual observations of temperatures have not conformed to predictions. Temperatures have been level in recent years. 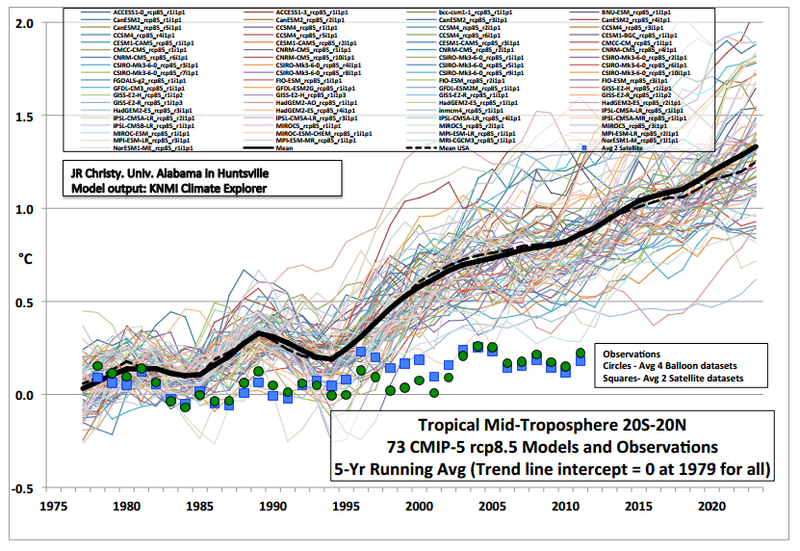 Here’s a simplified chart of the temperatures predicted by climate scientists compared to actual temperatures. A more complicated version follows. Click on either chart for a larger version. As you can see, actual temperatures have not risen as they should have, if only the Mother Earth would conform to the predictions of climate scientists. Despite this lack of predictive power, global warming alarmists (oops, I meant climate change alarmists) insist we should radically restructure our economy in order to accommodate the predictions of climate models that have been shown to be not very predictive — if we are concerned about accuracy. 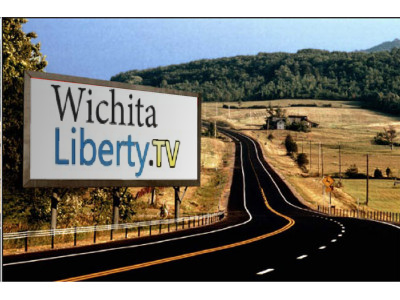 In this episode of WichitaLiberty.TV: The City of Wichita held a workshop where the Community Investments Plan Steering Committee delivered a progress report to the city council. The document holds some facts that ought to make Wichitans think, and think hard. Then: What is the purpose of high tax rates on high income earners? Finally: Advances in producing oil and natural gas make for a more competitive and carbon-efficient economy. Episode 33, broadcast March 2, 2014. View below, or click here to view on YouTube. The oil and gas boom in America boosts our competitiveness in the world economy while at the same time reducing carbon emissions, says economist Stephen Moore. 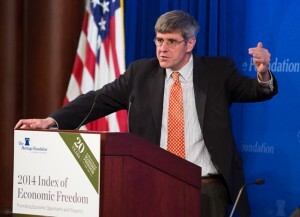 Moore recently left the Wall Street Journal to accept a position at Heritage Foundation as chief economist. He presented to an audience at a conference titled “The Tax & Regulatory Impact on Industry, Jobs & The Economy, and Consumers” produced by the Franklin Center for Government and Public Integrity. A large portion of his presentation was on energy and its important role in the economy, and how radical environmentalists — the “green” movement — are harming our economy and people. An irony, he said, is that while President Barack Obama is in the “hip pocket” of radical environmentalists, he is presiding over the greatest oil and gas boom in American history. This boom is proceeding in spite of government, not because of it. The boom in oil and gas production in America, made possible by horizontal drilling and fracking, is ahead of the rest of the world. While European countries have in the past embraced green energy technologies, these policies have failed, and the countries are retreating from them. 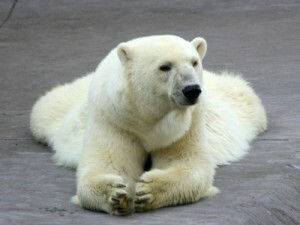 Now, European countries want to use American drilling technologies, he said. The lower electricity prices in America are a competitive advantage over Europe and China. German auto manufacturers are shutting plants in Europe and moving them to the United States, he said. Moore went on to tell the attendees that it is the United States that has reduced its carbon emissions the greatest amount in the last five years. He said this is remarkable in light of the fact that the U.S. didn’t sign the Kyoto Treaty, the U.S. didn’t implement cap-and-trade, and didn’t implement a carbon tax. “You would think these environmental groups would be applauding natural gas. Now these environmentalist groups have a new campaign called ‘beyond natural gas,'” he said. Over the past six years the U.S. has spent $100 billion promoting wind and solar power, but these two sources together account for just 2.2 percent of electricity generation. Even if the country were to quadruple the portion of electricity generated by these two renewable sources over the next 10 to 20 years, the nation would still need to get 90 percent of its electricity from other sources. Moore was doubtful that the country could quadruple the output from wind and solar. To further investigate the topics Moore raised, I gathered data from Global Carbon Atlas and prepared interactive visualizations using Tableau Public. You may access and use the visualizations by clicking here. Following are static excerpts from the visualizations. Click on each image for a larger version. Looking at the amount of total carbon emissions, we see two important facts. First, after rising slowly, carbon emissions by the United States have declined in recent years. 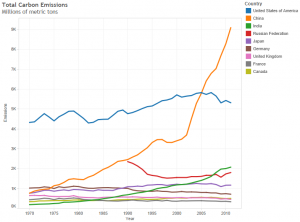 Second, carbon emissions by China are soaring. China surpassed the U.S. around 2005, and the gap between the two countries is increasing. 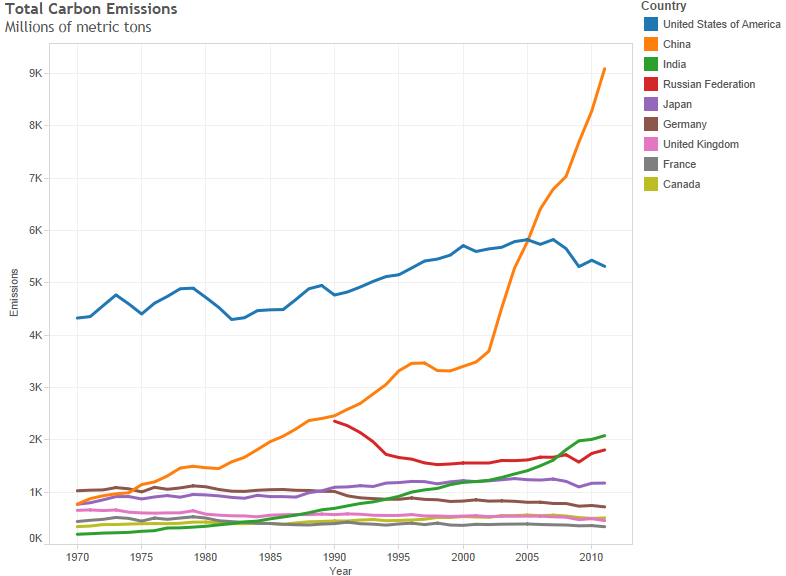 Note also that carbon emissions in India are rising. 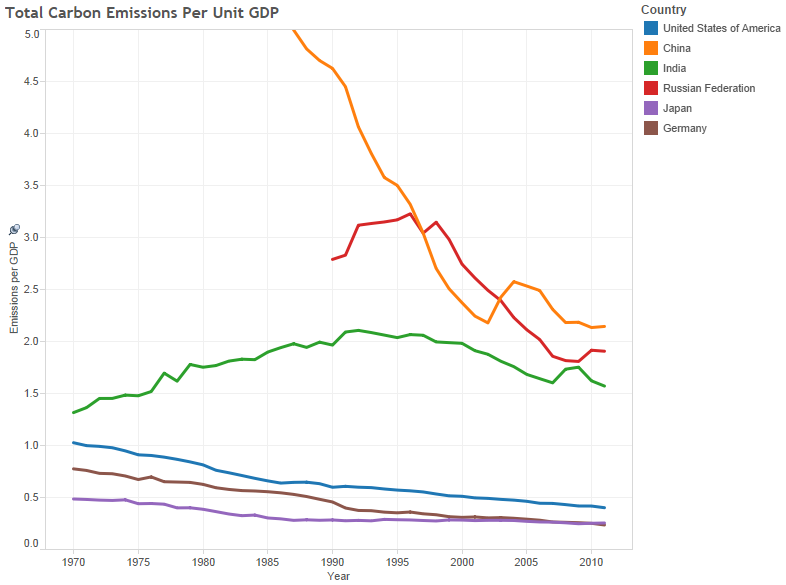 Emissions in most advanced economies are steady or falling. 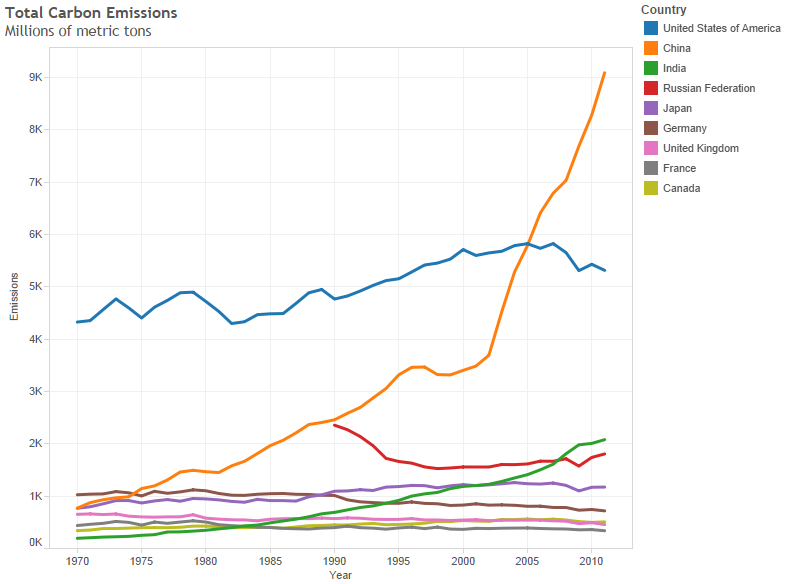 These trends are emphasized in the chart that shows carbon emissions for each country indexed from a common starting point. 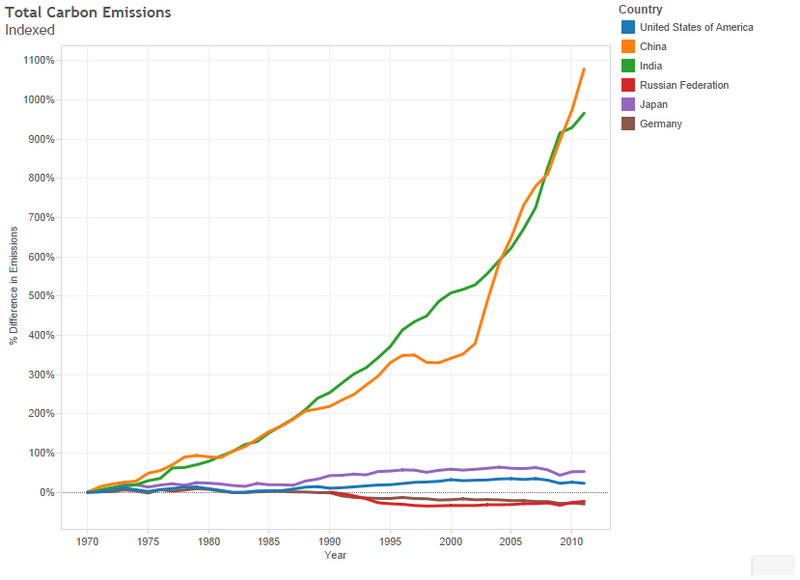 Emissions from China and India are rapidly rising, while emissions from countries with advanced economies have risen slowly or have declined. 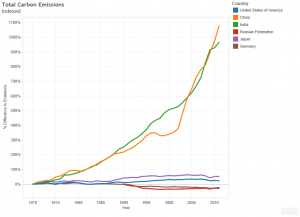 A chart that shows the carbon emissions efficiency of countries, that is, the carbon emitted per unit of GDP, shows that in general, countries are becoming more efficient. Advanced economies such as the U.S., Japan, and Germany have an advantage in this metric. 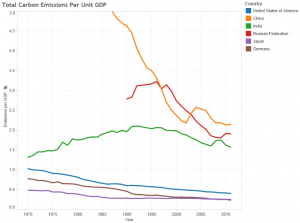 These countries emit about one-fourth as much carbon per unit GDP as does China. 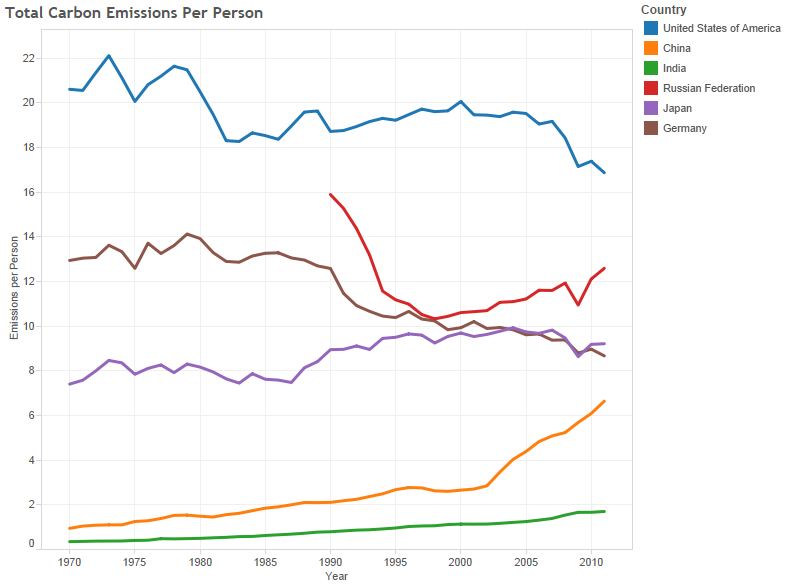 The chart of carbon emissions per person in each country show that the United States leads in this measure. In 2011, the U.S. emitted about 17 tons of carbon dioxide per person. China was at 6.6, and India at 1.7. 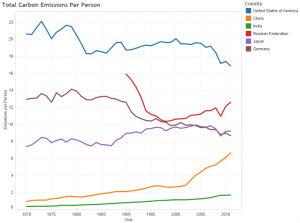 But, the trend in the U.S. is downward, that is, less carbon emitted per person. In China and India, the trend is up, and rising rapidly in China. Here’s the science that President Obama is basing policy on. Documentary filmmakers Phelim McAleer and Ann McElhinney have produced a feature film that will help America understand the truth about fracking. Fracking — short for hydraulic fracturing — is a method of oil and gas production by injecting pressurized fluid into rock formations. Along with horizontal drilling, this technology has lead to a rise in the production of natural gas, leading to much lower prices for consumers, and to the possibility of U.S. exports. FrackNation, the film that McAleer and McElhinney made, is set for premier on AXS TV on January 22, 2013 at 9:00 pm eastern. The elitists don’t really like farmers, he said. But they will gladly use them to make a political point. The idea that they would become independent from their largess is their concern. He added that opposition to fracking is anti-fossil fuel, anti-progress, and anti-modernity, but above all it is anti-American. Those opposed to fracking spread fear of environmental damage such as spilling the chemicals or polluting ground water. Is this fear real? McAleer said fracking has been going on since 1947. How long can you fear something that hasn’t happened, he asked. On the new Matt Damon movie Promised Land, described by the New York Times as “an earnest attempt, sometimes effective, sometimes clumsy, to dramatize the central arguments about fracking and its impact,” I asked what’s wrong with that movie? I mentioned an incident in an advertisement for the movie that shows a family receiving the results from testing their water. The tests showed that the water was clean and not dirty, like illustrated in a dirty brown milk jug. The reaction of the family was anger. McAleer explained that these people were suing the oil and gas companies. They demanded that the EPA come in and test their water, and the EPA said their water is safe. They watched their multimillion dollar lawsuit flushed down the drain, along with their celebrity status. Your movie FrackNation that’s coming out in January: What will it tell Americans? McAleer said the film will show there is absolutely no evidence that fracking has ever contaminated groundwater. But there is plenty of evidence that people have lied, exaggerated, and misrepresented fracking. I asked about the famous example in the movie Gasland of a family being able to light their drinking water on fire, the implication being that this was possible due to methane gas leaking into their water supply, with fracking being the cause. McAller said that people have been able to like their water on fire for many years before fracking started. Native Americans called certain places “burning springs.” These are naturally occurring events. The director of Gasland knew that, but he told me he left it out because it wasn’t relevant. It’s unethical journalism. Sustainable development. Sedgwick County Commissioner Richard Ranzau writes that next week the commission will vote on the issue of sustainable development, and whether Sedgwick County should participate in a planning process. Writes Ranzau: “Sedgwick County will be voting on this issue next Wednesday, April 4th, 2012. Those of you that have concerns about this need to speak up now. Please email and call the commissioners and encourage them to vote NO on this. If you are a property owner, business owner, home owner, builder, developer, farmer, or taxpayer you should strongly oppose this agenda. Now is the time to stop this. This is President Obama’s plan to use HUD, DOT, and EPA to implement Sustainable Development/Smart Growth/UN Agenda 21.” Ranzau has written on this issue. His paper is at Sustainable Development and U.N. Agenda 21: Economic Development or Economic Destruction? Contact information for commissioners may be found at Board of County Commissioners. As of this writing the agenda and explanatory material for the April 4th meeting is not available. When it is, it can be found at the same page. Pachyderms to feature talk on sustainable development. On a related matter, this Friday (March 30rd) the Wichita Pachyderm Club features Tom DeWeese, President, American Policy Center, speaking on the topic “U.N. Agenda 21: Sustainable Development.” DeWeese is one of the nation’s leading advocates of individual liberty, free enterprise, private property rights, personal privacy, back-to-basics education and American sovereignty and independence. … The public is welcome and encouraged to attend Wichita Pachyderm meetings. For more information click on Wichita Pachyderm Club. Climate models. William Happer, professor of physics at Princeton, calls attention to the problems of modern climate science in the pages of the Wall Street Journal. 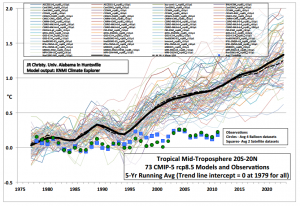 He asks: “What is happening to global temperatures in reality? The answer is: almost nothing for more than 10 years. … The lack of any statistically significant warming for over a decade has made it more difficult for the United Nations Intergovernmental Panel on Climate Change (IPCC) and its supporters to demonize the atmospheric gas CO2 which is released when fossil fuels are burned.” While there has been warming over the past two centuries, Happer warns of linking this to the activity of mankind: “There has indeed been some warming, perhaps about 0.8 degrees Celsius, since the end of the so-called Little Ice Age in the early 1800s. Some of that warming has probably come from increased amounts of CO2, but the timing of the warming — much of it before CO2 levels had increased appreciably — suggests that a substantial fraction of the warming is from natural causes that have nothing to do with mankind.” While we need high-quality science regarding the earth’s climate, the current climate models are not providing that: “It is easy to be confused about climate, because we are constantly being warned about the horrible things that will happen or are already happening as a result of mankind’s use of fossil fuels. But these ominous predictions are based on computer models. It is important to distinguish between what the climate is actually doing and what computer models predict. The observed response of the climate to more CO2 is not in good agreement with model predictions.” … The complete article in the Wall Street Journal (no subscription required) is Global Warming Models Are Wrong Again: The observed response of the climate to more CO2 is not in good agreement with predictions. … Some will discount this article because Happer’s specialty is modern optics, optical and radiofrequency spectroscopy of atoms and molecules, and spin-polarized atoms and nuclei — not climate science. But, we see the problems with modern climate science and its predictive abilities. Shy regulators. The Obama administration is so out of touch with the public that it appears shy about publicity over its actions. The Hill reports: “The Obama administration announced landmark carbon emissions standards for new power plants Tuesday, but hardly shouted from the rooftops about them. The administration rolled out the proposal with relatively little fanfare, and President Obama — who was in South Korea at nuclear security summit — did not issue a statement about the regulation. In contrast, when the Environmental Protection Agency issued final rules to control power plant mercury emissions in December, Obama praised them as major public health protections while touting White House efforts to ensure they don’t affect power grid reliability.” … More at White House, rather quietly, advances climate change agenda. Just say no to taxes. Those who reject tax increases under all conditions are often described unflatteringly. The New York Times house conservative David Brooks has called them “fanatics” with “no sense of moral decency.” William Voegeli, writing in City Journal explains why we should not consider higher taxes as a solution to problems. “In rejecting tax hikes, Republicans aren’t trading in fanaticism. Rather, they’re confronting a governing failure — an abiding lack of candor about what our welfare state costs — that voters grasp but Democrats refuse to admit.” … The problem is soaring spending, growing faster than the economy: “What we can say is that over the last 40 years, government revenues have kept pace with economic growth while government spending has run steadily ahead of it. … Gross Domestic Product and federal revenues, both expressed in per-capita terms and adjusted for inflation, were about two and a half times as large at the end of the period as at the beginning. Federal expenditures were three times as large.” It is welfare-state expenditures that have grown the fastest, and by far. … Voegeli lays the problem at the feet of the Democrats: “For years, the Democratic Party’s raison d’être has been to establish, defend, and expand the welfare state. The Democrats could have told us all along — forthrightly, scrupulously, and unambiguously — that their project would cost a lot of money and that, should economic growth be insufficient to pay for it, big tax increases would be necessary. Had they done so, they would be in a strong position to argue that the terms of the deal they struck with yesterday’s voters oblige today’s Americans to pay higher taxes. But that’s not what they did.” … Much more to read at Not a Penny More: The case for antitax absolutism. 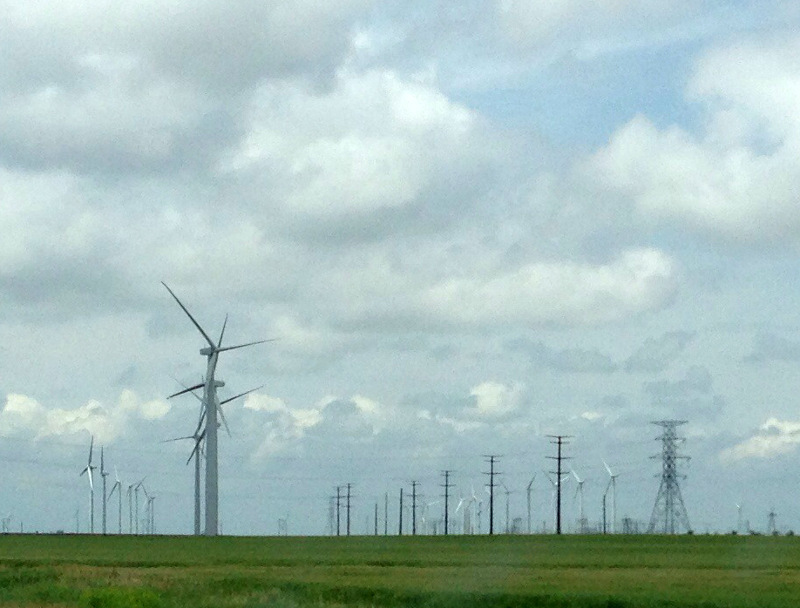 Recently Kansas Governor Sam Brownback wrote an editorial praising the benefits of wind power. (Gov. Sam Brownback: Wind offers clean path to growth, September 11, 2011 Wichita Eagle) Brownback has also been supportive of another form of renewable energy, ethanol. But not everyone agrees with the governor’s rosy assessment of wind power. Paul Chesser of American Tradition Institute offers a rebuttal of Brownback’s article, which first appeared in a Bloomberg publication. Chesser goes on to describe ATI’s study which illustrates the negative economic consequences of renewsable energy standards, which Brownback has supported. The study is The Effects of Federal Renewable Portfolio Standard Legislation on the U.S. Economy. Following is Chesser’s response to Governor Brownback. American Tradition Institute today called attention to the many fallacies in a column written by Kansas Gov. Sam Brownback and published yesterday in the Bloomberg Government newsletter (subscription required), in which the former U.S. Senator touted the “long-term benefits” and “job creation” ability of renewable energy, predominantly with wind power. “Unlike most of his fellow Republicans, it sounds like the governor continues to support President Obama’s failed initiatives to create ‘Green jobs’ in a hopeless attempt to save the U.S. economy,” said Paul Chesser, executive director of American Tradition Institute. Continue reading at ATI Release: Kansas Gov., Former Sen. Brownback Incorrect on Promise, Economics of Renewable Energy. 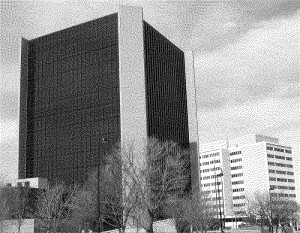 Evidence that a business seeking regulatory approval of its project enjoyed an apparently close relationship with the Kansas Department of Health and Environment should not be surprising. Regulatory capture — or at least the heavy-handed attempt by special interest groups to influence public policy to fit their interests — is a non-partisan sport. We shouldn’t be surprised to see this form of government failure taking place at all times, no matter which party or politicians are in power. As an example on point, the same type of activity happened during the administration of former Kansas Governor Kathleen Sebelius regarding the same electric plant that is the focus of controversy today. Her regulator, former KDHE Secretary Rod Bremby, denied the permit for the plant based on its carbon dioxide emissions, the first time that had been done in the United States. It was a victory for all of us and I appreciate their help. About that time Sebelius established the Kansas Energy and Environmental Policy Advisory Group, or KEEP. The activities of this group were managed — at no cost to the state — by the Center for Climate Strategies, a group that expressly advocates for energy policies and regulations based on an extremist view of climate science. The invasion of Kansas — at least the Sebelius administration — by Earthjustice and Center for Climate Studies proves the point: Regulatory capture is a non-partisan opportunity. Why not school choice in Kansas? WhyNotKansas.com is a website that holds information about the benefits of giving families the freedom of school choice. The site is new this week, and is a project of Kansas Policy Institute and Foundation for Educational Choice. Innovation in school choice programs is common in many states. Kansas, however, still grants the education bureaucracy a monopoly on the use of public dollars in education. Economics in one lesson this Monday. On Monday (May 9), four videos based on Henry Hazlitt’s classic work Economics in One Lesson will be shown in Wichita. The four topics included in Monday’s presentation will be The Curse of Machinery, Disbanding Troops & Bureaucrats, Who’s “Protected” by Tariffs?, and “Parity” Prices. The event is Monday (May 9) at 7:00 pm to 8:30 pm at the Lionel D. Alford Library located at 3447 S. Meridian in Wichita. The library is just north of the I-235 exit on Meridian. The event’s sponsor is Americans for Prosperity, Kansas. For more information on this event contact John Todd at [email protected] or 316-312-7335, or Susan Estes, AFP Field Director at [email protected] or 316-681-4415. Government and entrepreneurship. From an essay by Dane Stangler titled Entrepreneurship and Government, contained in Back on the Road to Serfdom: The Resurgence of Statism, edited by Thomas E. Woods, Jr.: “The third way in which the state can intrude on entrepreneurship is through distorted incentives: either with misguided regulations or unintended consequences, the government could end up creating the wrong incentives for entrepreneurs. Will Baumol discussed such institutional incentives in a famous article in which he argued. ‘How the entrepreneur acts at a given time and place depends heavily on the rules of the game — the reward structure in the economy — that happen to prevail.’ Problems arise when these rules of the game encourage ‘unproductive’ entrepreneurial behavior. The principal example of such unproductive behavior is rent seeking, which occurs when companies pursue a bigger slick of economic activity by means other than market competition — that is, when they graduate to seeking favors from Washington rather than seeking a competitive edge by means of innovation. A company’s entreaties to government for protective action often indicate a returns curve that has already turned negative.” … While the article mentions “favors from Washington,” we can easily substitute state capitols, city halls, or county courthouses. For example, Wichita’s economic development policy is firmly rooted in the belief that the city can direct entrepreneurial activity with no wrong incentives or ill consequences. Listening to the recent summit of aviation industry leaders with Kansas Governor Sam Brownback, it is apparent that this industry thrives on, and will continue to expect, large doses of incentives and special treatment and favor from government. But is the aviation industry best for the future of Wichita? While government leaders across Kansas pledge not to lose most important industry, we know it can happen (see Detroit). We have to be careful to make sure that our government policies don’t hasten this loss. While those who advocate cap and trade legislation charge that conservatives, particularly Charles and David Koch, have outspent them, a study finds the opposite. According to American University Professor Matthew Nisbet, in 2009 environmental groups spent $394 million on climate change and energy policy efforts such as promoting cap and trade. Opposition groups spent $259 million. Information like this helps place the reports of conservative spending, including that of Charles and David Koch, in perspective. Without this, we’re left with the one-sided reports from Greenpeace and the New Yorker magazine, in which numbers are mentioned without — or with little — context. Nesbit’s report is Climate Shift: Clear Vision for the Next Decade of Public Debate. Spending on elections is mixed. Considering contributions to members of Congress, proponents of cap and trade legislation outspent opponents. But in independent expenditures, the situation is reversed. But on Proposition 23 in California, environmental groups spent the most. To better understand the influence of spending in the cap and trade debate, in this chapter I review the nature, composition and funding sources of the U.S. environmental movement and compare these factors to the opposing coalition of conservative think tanks and industry associations. Then, analyzing data compiled from tax returns, annual reports, and other sources, I systematically compare the revenue and forms of spending by both sides in the debate. Though most environmental groups are limited in how much money they can devote to direct lobbying, in the debate over cap and trade, they were able to spend heavily on efforts to educate the public and policymakers on the need for a mandatory emissions cap, hiring the country’s top political consultants. They also invested in partnerships with corporations and other organizations in a strategy aimed at counter-balancing the amount spent on lobbying by opposing industry associations and companies. As the analysis indicates, the environmental movement has made sizable gains in closing the spending gap with their conservative and industry opponents. Indeed, the effort to pass cap and trade legislation may have been the best-financed political cause in American history. The effort also demonstrates not only the vast revenue base and organizational capacity of the environmental movement, but also the movement’s enhanced ability to coordinate activities among its constituent members and to build alliances. Owens still blocks judicial selection reform. Kansas Reporter writes that one man, Senator Tim Owens, an attorney and Republican from Overland Park, is still blocking judicial selection reform. But a move by the House gives Senate President Stephen Morris a chance to let Senators vote to concur with the reform measure passed by the House. Or, Morris could refer the measure to Owens’ Judiciary committee, where it will die. See New way of picking appeals judges gets second shot. Electric cars questioned. Margo Thorning writing in The Wall Street Journal, explains that the new crop of all-electric or near-all-electric cars not worthy of government support. She notes the Consumer Report opinion of the Chevrolet Volt: “isn’t particularly efficient as an electric vehicle and it’s not particularly good as a gas vehicle either in terms of fuel economy.” … Batteries remain a problem: “A battery for a small vehicle like the Nissan Leaf can cost about $20,000 and still only put out a range of 80 miles on a good day (range is affected by hot and cold weather) before requiring a recharge that takes eight to 10 hours. Even then, those batteries may only last six to eight years, leaving consumers with a vehicle that has little resale value. Home installation of a recharging unit costs between $900 and $2,100.” … Thorning notes that half of the electricity that powers America is generated by coal, so all-electric cars are still not free of greenhouse gas emissions. Also, “a substantial increase in the numbers of them on the road will require upgrading the nation’s electricity infrastructure.” … While electric cars are not ready to save the earth, the U.S. government insists on intervention: “Despite these significant flaws, the government is determined to jump-start sales for plug-ins by putting taxpayers on the hook. The $7,500 federal tax credit per PEV is nothing more than a federal subsidy that will add to the deficit. There are also federal tax credits for installing charging stations in homes and businesses and for building battery factories and upgrading the electric grid. The administration’s goal — one million PEVs on the road by 2015 — could cost taxpayers $7.5 billion.” And saddle Americans with expensive automobiles that do little to address the problem they’re designed to solve. Reading the Journal article requires a subscription, but it is also available at The American Council for Capital Formation, where Thorning is Senior Vice President and Chief Economist. Government as business. Yesterday’s reading from Robert P. Murphy’s book Lessons for the Young Economist explained the value of the profit-and-loss system in guiding resources to where they are most valued. For those who wan to “run government like a business” I offer today’s excerpt from the same book, which explains how lack of the ability to calculate profit means this can’t happen: [Regarding a capital investment made by Disney as compared to government:] The crucial difference is that the owners of Disneyland are operating in the voluntary market economy and so are subject to the profit and loss test. If they spend $100 million not on personal consumption (such as fancy houses and fast cars) but in an effort to make Disneyland more enjoyable to their customers, they get objective feedback. Their accountants can tell them soon enough whether they are getting more visitors (and hence more revenue) after the installation of a new ride or other investment projects. Remember it is the profit and loss test, relying on market prices, that guides entrepreneurs into careful stewardship of society’s scarce resources. In contrast, the government cannot rely on objective feedback from market prices, because the government operates (at least partially) outside of the market. Interventionism is admittedly a mixture of capitalism and socialism, and it therefore (partially) suffers from the defects of socialism. To the extent that the government buys its resources from private owner — rather than simply passing mandates requiring workers to spend time building bridges for no pay, or confiscating concrete and steel for the government’s purposes — the government’s budget provides a limit to how many resources it siphons out of the private sector. (Under pure socialism, all resources in the entire economy are subject to the political rulers’ directions.) However, because the government is not a business, it doesn’t raise its funds voluntarily from the “consumers” of its services. Therefore, even though the political authorities in an interventionist economy understand the relative importance of the resources they are using up in their program — because of the market prices attached to each unit they must purchase — they still don’t have any objective measure of how much their citizens benefit from these expenditures. Without such feedback, even if the authorities only want to help their people as much as possible, they are “flying blind” or at best, flying with only one eye. Wichita City Council this week. As it is the fourth Tuesday of the month, the Wichita City Council handles consent agenda items only and often has a workshop. Consent agenda items are thought by the agenda-builder to be non-controversial, and are voted on by the council as a group, unless a council member requests to pull an item for individual discussion and voting. … This week’s meeting will also feature the awarding of a key to the city to Kansas Governor Sam Brownback. Perhaps the governor will take a moment to comment on his economic development plan, which discourages the type of targeted incentives that Wichita relies on. … The agenda packet is at 03-22-2011 Council Agenda Packet. Government the problem. Rasmussen: “Ronald Reagan famously declared in his first inaugural address in January 1981 that ‘government is not the solution to our problem; government is the problem.’ Forty-six percent (46%) of Likely U.S. Voters tell us in a new national telephone survey that that policy position is held mostly by conservatives and 40% say Reagan’s view is shared by most Americans.” The poll finds “Just 19% of the Political Class believe Reagan’s view is shared by most Americans.” The political class is the minority of voters who believe in big government. Rasmussen says they “tend to trust political leaders more than the public at large and are far less skeptical about government.” The Wall Street Journal has more on this at Populism and the Political Class. Budget worse than thought. “The Congressional Budget Office on Friday released its analysis of President Obama’s 2012 budget proposal and found it does less to rein in deficits and the debt than the administration had estimated.” A large share of the blame is placed on the extension of the Bush-era tax cuts. See CBO: Obama budget worse than projected on 10-year deficit. Detroit turns schools over to charters. From Education Week: “The financially embattled Detroit school system has announced a controversial plan to turn nearly a third of the district’s 141 schools over to charter operators or education-management organizations by next school year. Officials say their only other option is to close dozens of low-performing schools. If the plan to hand 41 schools over to outside managers is approved by the school board, the 73,000-student Detroit district will be borrowing a page from the same playbook that a growing number of large urban districts seem to be using.” … The article notes that Philadelphia turned over seven schools to charter operators, and Los Angeles will turn over seven next year. Charter schools are funded by public money but operate largely outside the existing public school system. They usually have wide latitude in setting policies, and generally the teachers union is not involved. Not everyone thinks the plan will work, with one critic writing “Chartering schools is not a silver bullet that can solve the long-standing governance, financial, and academic issues that districts like Detroit face.” … Kansas has few charter schools as Kansas law is designed to ensure that few charters will be granted. The State and the Intellectuals. Murray N. Rothbard asks the question “Why do people obey the edicts and depredations of the ruling elite?” and provides the answer. From For a New Liberty: The Libertarian Manifesto: The answer is that, since the early origins of the State, its rulers have always turned, as a necessary bolster to their rule, to an alliance with society’s class of intellectuals. The masses do not create their own abstract ideas, or indeed think through these ideas independently; they follow passively the ideas adopted and promulgated by the body of intellectuals, who become the effective “opinion moulders” in society. And since it is precisely a moulding of opinion on behalf of the rulers that the State almost desperately needs, this forms a firm basis for the age-old alliance of the intellectuals and the ruling classes of the State. The alliance is based on a quid pro quo: on the one hand, the intellectuals spread among the masses the idea that the State and its rulers are wise, good, sometimes divine, and at the very least inevitable and better than any conceivable alternatives. In return for this panoply of ideology, the State incorporates the intellectuals as part of the ruling elite, granting them power, status, prestige, and material security. Furthermore, intellectuals are needed to staff the bureaucracy and to “plan” the economy and society. … In the modern era, when theocratic arguments have lost much of their lustre among the public, the intellectuals have posed as the scientific cadre of “experts” and have been busy informing the hapless public that political affairs, foreign and domestic, are much too complex for the average person to bother his head about. Only the State and its corps of intellectual experts, planners, scientists, economists, and “national security managers” can possibly hope to deal with these problems. The role of the masses, even in “democracies,” is to ratify and assent to the decisions of their knowledgeable rulers. Global warming panic explained. A liberal tries to explain why she thinks the world will end, and what should be done about it. From Battlefield315. But if you have $1,975,000 he’ll sell you a lot for a luxury vacation home. He campaigns against the use of oil — while at the same time being paid by United Airlines to create advertisements encouraging flying. Filmmakers Ann McElhinney and Phelim McAleer have put together a short film that illustrates. View it below or in glorious high-definition at Robert Redford Hypocrite. This Week in Kansas. On This Week in Kansas guests Rebecca Zepick of State of the State KS, Kansas Public Radio Statehouse Bureau Chief Stephen Koranda, and myself discuss the upcoming session of the Kansas Legislature. Tim Brown is the host. This Week in Kansas airs on KAKE TV channel 10, Sunday morning at 9:00 am. Tax increment financing. “Largely because it promises something for nothing — an economic stimulus in exchange for tax revenue that otherwise would not materialize — this tool [tax increment financing] is becoming increasingly popular across the country. … ‘TIFs are being pushed out there right now based upon the but for test,’ says Greg LeRoy. ‘What cities are saying is that no development would take place but for the TIF. … The average public official says this is free money, because it wouldn’t happen otherwise. But when you see how it plays out, the whole premise of TIFs begins to crumble.’ Rather than spurring development, LeRoy argues, TIFs ‘move some economic development from one part of a city to another.’ … In Wichita, those who invest in TIF districts and receive other forms of subsidy through relief from taxes are praised as courageous investors who are taking a huge risk by believing in the future of Wichita. Instead, we should be asking why we have to bribe people to invest in Wichita. Much more on tax increment financing at Giving Away the Store to Get a Store: Tax increment financing is no bargain for taxpayers from Reason Magazine. Lessons for the Young Economist. The Ludwig von Mises Institute has published a book by Robert_P._Murphy titled Lessons for the Young Economist. Of the book, the Mises Institute says “It is easily the best introduction to economics for the young reader — because it covers both pure economic theory and also how markets work (the domain of most introductory books).” From my reading of samples of the book, I would agree, and also add that readers of all ages can enjoy and learn from this book. The book is available for purchase, or as is the case with many of the works the Institute publishes, it is also available to download in pdf form at no charge. Click on Lessons for the Young Economist. China has seen the future, and it is coal. George Will in The Washington Post: “Cowlitz County in Washington state is across the Columbia River from Portland, Ore., which promotes mass transit and urban density and is a green reproach to the rest of us. Recently, Cowlitz did something that might make Portland wonder whether shrinking its carbon footprint matters. Cowlitz approved construction of a coal export terminal from which millions of tons of U.S. coal could be shipped to Asia annually. Both Oregon and Washington are curtailing the coal-fired generation of electricity, but the future looks to greens as black as coal. The future looks a lot like the past.” Will goes on to explain how it is less expensive for coastal Chinese cities to import American and Australian coal rather than to transport it from its inland region. China uses a lot of coal, and that is expected to increase rapidly. The growth of greenhouse gas emissions in China trumps — by far — anything we can do in American do reduce them, even if we were to destroy our economy in doing so. The recent tax bill has a $3 billion grant for wind projects. The 2009 stimulus bill had $30 billion for wind. Wind power installations are way down from recent years. The 2008 stimulus bill forces taxpayers to pay 30% of a renewable energy project’s costs. Wind energy also get a tax credit for each unit of power produced. This information is timely as Kansas Governor Mark Parkinson recently released a list of his “achievements,” three of which involve increasing wind power in Kansas. Kansas lags in charter schools. It won’t be a surprise to regular readers of this site, but Kansas is way behind most states in taking advantage of charter schools. This is a school reform measure that, while not perfect and doesn’t succeed in all cases, provides a way to increase opportunity for often the most disadvantaged students. It also increases opportunity for those students who don’t directly use them. Paul Soutar takes a look at how Kansas earns such a poor evaluation regarding charter schools in his article Weak Charter School Law Works Against Taxpayers’ Interests. Bureaucrats Gone Wild in Cancun. Global warming alarmists are meeting, and Americans for Prosperity is there to keep an eye on them. AFP says: “The United Nations Climate Change Conference is meeting in Cancun, Mexico from November 29 — December 10, 2010 where bureaucrats will work to transfer wealth and technology from developed to developing nations by raising the cost of traditional energy. But before these international bureaucrats get to ‘work’, they decided to throw a lavish party for themselves.” A news headline spotlighted in a video produced by AFP reads “Cancun climate change summit: scientists call for rationing in the developed world. The video is here: Bureaucrats Gone Wild in Cancun. AFP is taking its Hot Air Tour there. There are two ways to view this event: online, or by attending a watch party. There’s one in Wichita Thursday evening. Click on Hot Air Tour: Live from Cancun for more information and to register. Obama federal employee pay freeze — or not. President Barack Obama has been praised for instituting a pay freeze for federal employees. But the freeze may not be all it seems to be. Vincent Vernuccio of the Competitive Enterprise Institute reports: “President Obama’s proposal of a pay freeze for federal employees is a small step towards curbing government spending. However, a closer look shows there is less to it than meets the eye. In fact, many federal employees will still see their salaries increased. While Obama’s plan would stop the annual across-the-board cost of living adjustment (COLA) for all federal workers, it will not stop workers from getting raises altogether. The freeze will not affect pay raises for job classification upgrades. As an official at the Office of Management and Budget told Federal News Radio, ’employees will still be eligible for step increases. '” The full analysis is at the Daily Caller in Federal workers will still receive raises despite pay freeze. The moral case against spreading the wealth. From The Moral Case Against Spreading the Wealth by Leslie Carbone: “After two years, the results of President Obama’s wealth-spreading policies have confirmed centuries of economics, political philosophy, and common sense: Forced wealth redistribution doesn’t make things good for everybody; it makes things worse, both fiscally and morally.” Carbone explains the two reasons: Government-mandated wealth distribution does create prosperity, and it’s not a legitimate function of government. On the type of behavior we’d like to see in people, she writes: “Wealth redistribution discourages the virtuous behavior that creates wealth: hard work, saving, investment, personal responsibility.” After explaining other problems that progressive taxation — wealth redistribution — causes, she sounds a note of optimism: “Through Tea Parties and popular protests, millions of Peters and Pauls, and Joe the Plumbers are rejecting what F.A. Hayek so aptly called the fatal conceit of paternalistic government. Decades of federal expansion have demonstrated what history, economics, philosophy, and common sense have told us all along: People, working through the market, are the engines of prosperity, both moral and financial — but only if we get government out of their way.” Leslie Carbone is the author of Slaying Leviathan: The Moral Case for Tax Reform. That book expands on the ideas presented in this article. AFP to host climate conference event. This week the United Nations Climate Change Conference meets in Cancun, and Americans for Prosperity is taking its Hot Air Tour there. There are two ways to view this event: online, or by attending a watch party. There’s one in Wichita Thursday evening. Click on Hot Air Tour: Live from Cancun for more information and to register. Christmas organ concert tomorrow. On Wednesday December first, Wichita State University Organ Professor Lynne Davis will present the First Annual Christmas Organ Concert. This event is part of the “Wednesdays in Wiedemann” series. Tomorrow’s program includes voice with Paul Smith, theater organ with Jim Riggs, and Christmas carols. These recitals, which have no admission charge, start at 5:30 pm and last about 30 minutes, although this special performance is scheduled to last 45 minutes. The location is Wiedemann Recital Hall (map) on the campus of Wichita State University. Free exchange of ideas and gunfire at universities. Today’s Wichita Eagle carries a letter by a university teacher opposing the carrying of concealed guns on college campuses. One point the teacher makes is “And, ultimately, I don’t believe that universities can continue to foster the free exchange of ideas once they have been reconstituted as free-fire zones.” This idea, that concealed carry results in “free-fire” hasn’t been noticed, at least in Kansas. A Wichita Eagle article from last year, when the Kansas concealed carry law had been in effect for three years, reports no problems with the law. Firefights have not erupted in our streets as the result of the concealed carry law. Solution to Kansas school funding. Wichita’s Brent Davis offers commentary on his blog about Kansas school spending and its advocates: “School funding advocates like superintendent Morton of Newton are clearly biased since they directly benefit from increased taxation for schools and yet there is no direct correlation in any available data of economic growth trending with educational expenditure.” Davis is in the education industry, so his opinion should be given consideration. The full article is on his blog at The Solution to Kansas’ Ed Funding Paradox. Kansas school landscape. In an Insight Kansas editorial as presented at State of the State Kansas, Wichita State University professor H. Edward Flentje lays out the landscape of Kansas school finance and the surrounding politics. “In sum, the education article [of the Kansas Constitution] and related court action have moved duly elected state lawmakers — the governor and the legislature — to the sidelines in governing and financing public schools. Any agenda for educational reform will be subject to the liking of the state’s educational establishment and state court judges. Most state and local board members, school superintendents, public school teachers, and the statewide associations representing these interests, not to mention school finance litigators, prefer it this way.” He also — correctly in my opinion — forecasts a dim future for meaningful school reform in Kansas: “Evidence suggests this alliance will be slow to move on reform initiatives shaping the future of public schools, such as charter schools, merit pay, student assessment, and revision of school finance, among other issues.” … While incoming governor Sam Brownback has a plan for education reform in Kansas, it seems mostly focused on revising the school finance formula and a host of minor issues. Important reforms like charters schools and teacher merit pay seem to be missing from consideration at this time.